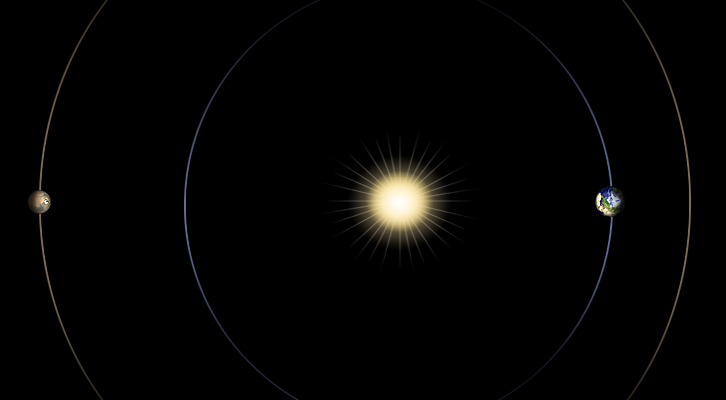 Due to a Mars Solar Conjunction, an alignment where the Sun blocks the line of sight between Earth and Mars, there will be limited communication with the rovers or orbiters on Mars until May 1 2013.This particular planetary alignment began on April 4. Because of the interference from the Sun, any communications risks getting garbled on its way from Earth to Mars or vice versa. If we were to send a command to a rover and it became scrambled the rover could easily be put in danger, so scientists generally send a large number of sequenced, toned-back commands before Mars Solar Conjunctions. Both Mars Science Laboratory (MSL) Curiosity and Mars Exploration Rover Opportunity are prohibited from driving, so instead they are tasked with studying their surroundings. The rovers will continue sending brief tones to Earth so that the science teams can assess their safety. NASA's orbiting Mars Odyssey, Mars Reconnaissance Orbiter, and the ESA's Mars Express Orbiter will continue to make observations of the planet, based on pre-input directions, but the latter two will most likely not transmit any data back to Earth until May 1 2013. Mars Odyssey will transmit some data back to Earth over the next month. This is Curiosity's first time going through a Mars Solar Conjunction, which occurs every two years, but Opportunity has been through a handful of them, so there isn't much to be concerned about. Be sure to check back in on them once communications are reestablished!